Today we will walk to Wage Hope as Team WandaWoman. We walk in memory of a very brave and strong lady, my sister-in-law who fought a courageous battle with pancreatic cancer. We miss Wanda everyday! We are striding to end a deadly disease at the Pancreatic Cancer Action Network’s PurpleStride Orange County 2016 Presented by Wienerschnitzel. It is estimated that more than 53,000 people will be diagnosed with pancreatic cancer in the United States this year and approximately 72 percent of patients will die in the first year of diagnosis. You can help change these statistics. PurpleStride Orange County 2016 Presented by Wienerschnitzel raises awareness and critical funds to advance research, support patients and create hope in the pancreatic cancer community. For more information about the Pancreatic Cancer Action Network and its important work, please visit their website at pancan.org. Pancreatic cancer is one of the deadliest cancers. With a survival rate in the single digits, it is one of the only major cancers to see little improvement. Yet, according to a recent survey, 60% of people know “almost nothing” about pancreatic cancer. It’s time to elevate the global conversation. Imagine if we could unite the planet in support of a common goal. That’s the idea behind World Pancreatic Cancer Day. November 17, 2016, is a day we will unite and make our voices heard. In the battle against pancreatic cancer we will show the world we are #InItTogether. According to a worldwide survey, sixty percent of people know “almost NOTHING” about pancreatic cancer. It’s time to elevate the global conversation and draw attention to pancreatic cancer and the need for greater awareness. By showing the world we are in this fight together, we hope to save lives and create a brighter future for people around the globe. Make the World See Purple! November is Pancreatic Cancer Awareness Month. And November 13, 2015 is World Pancreatic Cancer Day. Join the Pancreatic Cancer Action Network on November 13, World Pancreatic Cancer Day, to raise awareness about one of the nation’s deadliest cancers, which has a five-year survival rate of just seven percent. You can join the fight by wearing purple and letting your family, friends, co-workers and loved ones know you Wage Hope against pancreatic cancer. • In 2015, nearly 49,000 people will be diagnosed with pancreatic cancer in the United States, and more than 40,000 will die from the disease. • Only seven percent of Americans diagnosed with pancreatic cancer survive more than five years. • An estimated 72 percent of Americans will die within the first year of diagnosis. On Saturday, May 3, 2014, we walked in memory and honor of my sister-in-law, who lost her courageous battle with pancreatic cancer on 12/27/12. We came together for our 3rd annual event as Team Wanda Woman (link to 1st and 2nd). Our team was over 15 walkers strong this year and had many supporters who donated online. I am so thankful that we come together, to fight as a team, whether you were able to walk on Saturday or if you sent your love and support- we appreciate you! Wanda was definitely mentally tough- she fought a long battle with a quiet courage, never complaining and frequently smiling instead of crying. She taught me a lot, and I hold onto her memory as daily inspiration. When you are facing a diagnosis such as Pancreatic Cancer, it’s very easy to prioritize what is important and what is not. All the drama, arguing and trivial stress shifts to healing, hoping and praying. She had a beautiful knack for waiving off those who continually brought chaos to her doorstep. Even before the pancreatic cancer diagnosis, Wanda was very involved with walking for cancer, walking every year at the Revlon’s event on Mother’s Day weekend. Team Wanda Woman plans on walking again in May 2015, with Wanda’s spirit. I would encourage you to get involved in a local event and save the date for next year’s PurpleStride in LA <walking for a cure to Pancreatic Cancer>. On Sunday, May 19, 2013 we walked in memory & honor of my sister-in-law, who lost her brave battle with pancreatic cancer on 12/27/12. The PurpleStride Pancreatic Cancer walk was held in Exposition Park, which was beautiful, near the USC campus and many museums. Though the scenery was beautiful and the weather was perfect at 75 degrees, we walked with heavy hearts. It was a stark contrast from last year’s walk, which was very inspirational, fun and cheerful (link to last year’s walk story). At the starting line, I couldn’t hold my tears back any longer and of course, that upset my son who held my hand for a long time afterward, until football/basketball/trash talk with his sister and cousins lured him away from my side. We walked. Our group didn’t stay together, everyone had their own pace this time. There was no cheering, like last year when they would yell Team Wanda Woman, and our entire group would cheer, hoot and holler. This year, there were nice volunteers with signs, but no one cheered. Maybe they knew. Maybe they saw our faces. Maybe they felt the grief in our hearts. Much to my son’s dismay, there was also no face painting – we had just missed the lady and the kids were upset. To try to pacify them, they were given balloon animals and swords. We showed up representing Team Wanda Woman, representing our angel. I appreciate everyone on our team, whether you were able to walk Sunday or if you sent your love and support. We still are Team Wanda Woman and will walk in her memory to fight Pancreatic Cancer for future generations! Wanda was a tough cookie, who fought courageously until the last day. Pancreatic Cancer is one of the most painful cancers, and I don’t remember Wanda complaining to anyone, not even her doctors. Wanda had a strong grace, just one of the many things that I admired about her. We miss our hero, our angel, there’s a hole that I just can’t put into words. Some of us tried the Grilled Cheese truck, a percentage of the proceeds were donated to PurpleStride <walking for a cure to Pancreatic Cancer>. While we were eating, the kids’ balloons fell onto the grass and popped (the symbolism–not lost upon me). While the event volunteers were cleaning up, the kids went to help pop the balloon decorations, and many of the balloons were released. My son whispered in my ear that they were being sent up to his Auntie Wanda in heaven. Sunday’s walk was difficult, for all of us. But I am glad we stood together as Team Wanda Woman, in honor of my hero. Team Wanda Woman- Walk for Pancreatic Cancer! 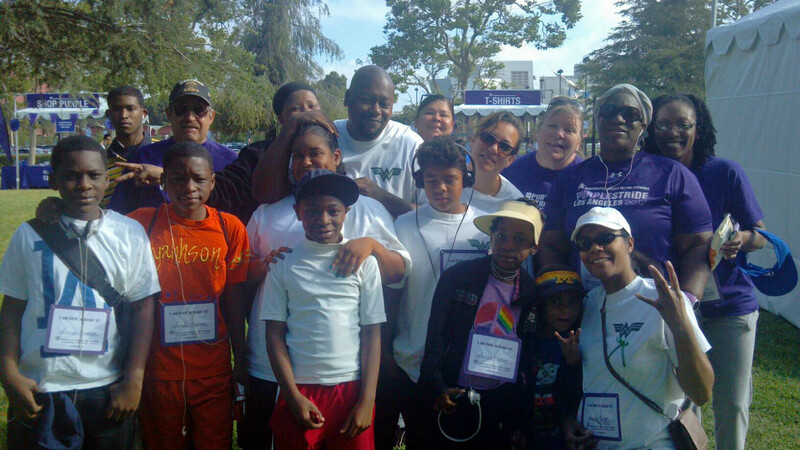 Last Saturday, 5/12/12, we walked in support of my sister-in-law’s battle with pancreatic cancer. The day was inspirational as our team assembled our 28 walkers, with another 10 virtual supporters. Our team consisted of family, such as Wanda’s sons, brother, sister, nephews, niece, aunts, and cousins. The farthest traveled by far is our surprise walker, our cousin from Georgia. His traveling to support Wanda was really overwhelming and a great surprise! Distant relatives, good friends and co-workers also came out to support Team Wanda Woman. I appreciate everyone on our team because I know that your support, friendship and love means so much to Wanda. The love and support shown makes her stronger and gives her what she needs to continue to fight. Our walkers wore both the PurpleStride event t-shirts and the Team Wanda Woman t-shirts that had the Wonder Woman logo on both the front and back. “We Fight as a Team” was printed on the back and rings so true for our fight against Pancreatic Cancer and finding a cure for Wanda. We mostly walked as a group and stayed together much of the way. We began the walk toward the end of the crowd because we were waiting for some late arriving team members to join us. We don’t leave anyone behind, much to the dismay of our competitive team members <like my son> who prefer to be at the beginning of the crowd. As we walked, we talked, joked and laughed. Every so often, a volunteer from Pancan/PurpleStride directing us, would see our t-shirts and yell “TEAM WANDA WOMAN!”, causing us to cheer and holler. The cheering, talking and joking helped me walk the 3 miles without a huge struggle, though I was going pretty slow. After the walk ended, there were booths to visit. The kids had their faces painted and received balloons. Some of our team stayed for a delicious lunch, at The Counter. I hope the photos below show you how passionate we are about finding a cure for pancreatic cancer and how much we love Wanda! 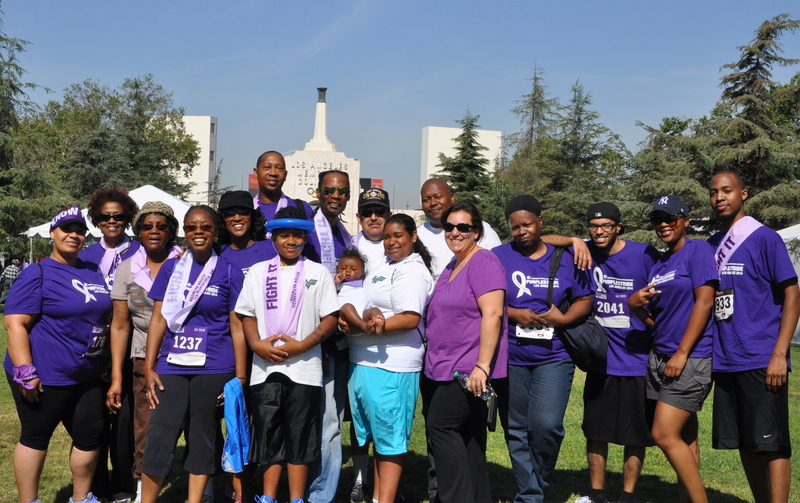 I would encourage you to get involved in a local event and save the date for next year’s PurpleStride in LA <walking for a cure to Pancreatic Cancer>. We walk together for Wanda! More kids walking for Team Wanda Woman! I am so excited for Saturday’s PurpleStride Pancreatic Cancer walk! Our team’s goal was to raise $1,000.00. We have 20 team members who have already registered and raised an astonishing $1,210 to find a cure for Pancreatic Cancer! Thank you for your generous donations and to everyone who will be there on Saturday walking. I would also like to thank all of our virtual team members who will be with us in our hearts. Your support, love & prayers mean the world to us! It’s not too late to join. You can register on the team’s website (listed below) or register on Saturday at the walk. Registration begins at 7:30am. The opening ceremonies are at 8:30am. I would love to see you there! For many years, we walked in the Revlon Woman’s Cancer walk around the LA Coliseum. This will be our first year walking in the PurpleStride, and I am very excited to see our friends & family actively supporting Wanda in her courageous battle.